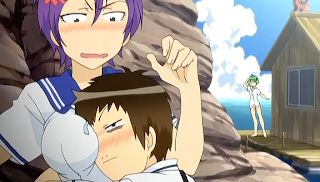 Here we have Umisho, one of those typical fanservice anime. Nothing wrong with that, ne? Umisho is about a school called Umineko Shougyou, a.k.a. 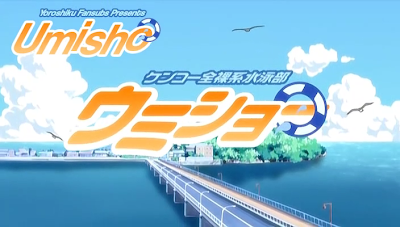 Umisho, it's swim team, and the unusual transfer student who pretty much becomes an ace member for her...original way of swimming. 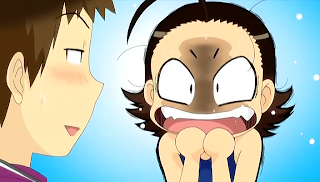 Kyon--er, Kaname Okiura, Umisho High's swimming team manager, who's been traumatized from swimming at a young age. My plot-line senses are tingling! Amuro Ninagawa, your over-the-top energetic person. Her swimming style is unique, but her personality is obscure. Definitely obscure. 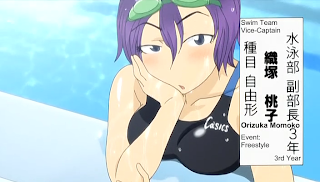 Momoko Orizuka, the swim team's vice-captain. 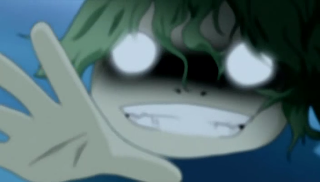 Her personality reminds me that of Nobue Itoh from Ichigo Marshmallow. 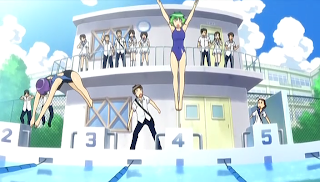 To put it briefly, the episode starts off an ordinary day for the swim team, until Maki comes running in, telling everyone there's a big commotion at the beach. 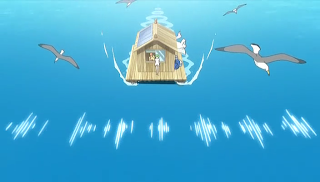 They all go to check out what's going on, and find a house speeding towards land. Anyways, Kaname has a familiar feeling he's met Amuro before, as does she, so you obviously know what to expect. Especially from the picture below. 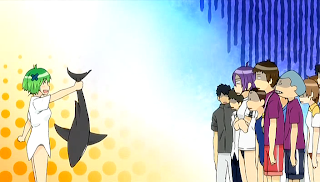 She invites herself to their swim team, VERY confident in her swimming abilities, but Momoko wants to test that, leading to them racing, and even stalking the poor ignorant girl. "IT CAME FROM THE SEA!!!" If you saw something like this pull you under, you'd be traumatized, too! Oh, I forgot to introduce this character. 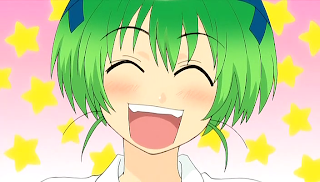 Don't worry, though, cause she seems pretty annoying, so I probably won't even mention her much. Oh, by the way, her name's Maki Ikuta. The big commotion? The house on the water. Have you seen my bra? 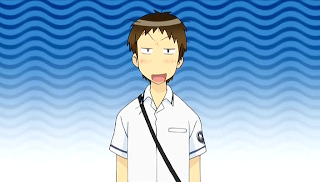 This guy reminds me of Kyon, but with an actual personality. 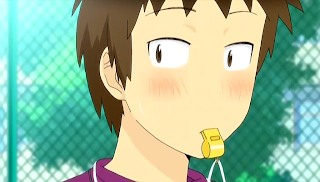 Not that there's nothing wrong with Kyon himself. Good hiding spot! I approve! 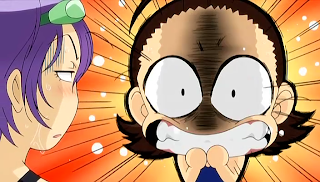 Both subbers for this series, Ayu and Yoroshiku, are doing awesome jobs right now. Either one works fine by me, but since I'd say Yoroshiku's font is easier on the eyes!